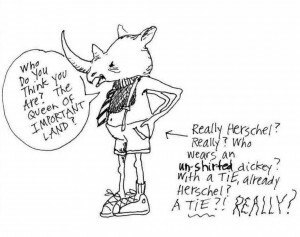 Herschel is an upright rhinoceros wearing an un-shirted dickey, suspenders, and broad striped tie, standing in front of a swing set at dusk. He moves rarely, maybe never. He watches what I say and what I do. He scoffs knowingly and regularly. Herschel told me I was selfish for loving art. Herschel loves repeatable skill work and on-the-job training. Herschel is never invited to hang out, but he shows up. I don’t like him much. But he’s so freaking tall.